Living in the past, wishing that things were different from the way they were or are, not only causes our suffering, but also makes us mediocre. 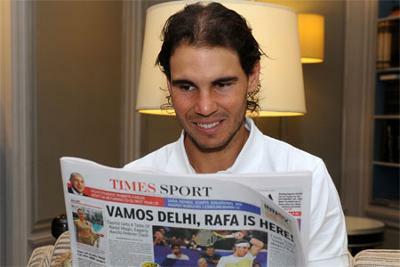 Yesterday’s Times of India and Economic Times had interviews with Rafael Nadal. His answers to a couple of questions establish a deep linkage, yet again, between spirituality and high-performance. TOI asked Nadal: Talking about your worst losses, do you think it is tough getting over them and how do you prepare yourself after the loss? And he replied: I am a very good loser. I always accept losses very well. We lose more than we win. Every week, just one player wins and the rest lose. You need to accept that and be positive and see where you can improve. For sure, the family helps but I am a good loser and I’m not a guy who becomes sad for three weeks after losing. I accept it and move on. ET’s Boria Majumdar asked Nadal: You have been plagued by many injuries in recent times. Have you ever thought that had it not been for injuries where would you be today? Perhaps a few more Grand Slams, perhaps a higher ranking? And he replied: Injuries are part and parcel of a sportsman’s Life. They will happen. Having said that I don’t always think about them or about what could have been. There is a direct connection between inner peace, happiness and peak performance. You may be able to perform at the top of your game a few time based on your talent and potential, but you need to have a Nadal-like spiritual perspective to stay at the top and remain relevant consistently. This, I say, is not just true for sport – it is as true in any walk of Life. The sum and substance of what Nadal told TOI and ET is this: There will be ups and downs in Life. Don’t get bogged down by what could have been or what isn’t there. Just accept what is and move on. High performers go beyond hard work. They know the value of inner peace and happiness. They know that both of these come with acceptance of what is – and that includes failure! They know that their peak performance depends on how anchored and peaceful they are. The truth is that each of us is capable of high performance in our chosen fields. But we rarely achieve our peaks or sustain them only because we are going by social definitions of who we are and what we are doing or have done. To be able to do very well, what you love doing, just don’t brood over what’s dead – the past! Keep moving on.